Today, July 25, 2016, marks the centennial of the beginning of the Appalachian song collecting fieldwork of Cecil J. Sharp and Maud Karpeles. The NC Folklife Institute and the Country Dance and Song Society are sponsoring the celebration and recognition of this important work. The Madison County Arts Council, Mars Hill University, the English Folk Dance and Song Society, and others join us in the effort. 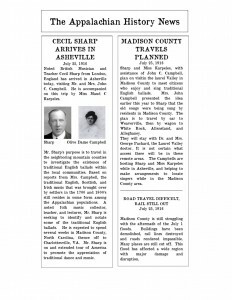 One hundred years ago, in the wake of a massive flood of the French Broad River, with stifling heat and disruption, Cecil and Maud set out, with the assistance of John C. and Olive Dame Campbell and Helen Storrow of MA, to travel the Appalachian region, first in Madison County, NC, then in subsequent months and years to other counties and other states, including VA, TN, KY, and WV. 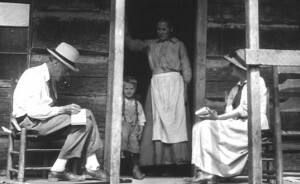 The result was a strong appreciation of the influence of traditional English music within Appalachian culture, a regard that continues to this day. As with all things American, this influence blended with many other traditions in forming the very vibrant state of music throughout the region. Please take a look at our website (cecilsharpinappalachia.org). There will be frequent postings that will reflect the progress of Sharp and Karpeles travels in 1916 during this year. A centennial is a good marker of durability and meaning. We are pleased to be a part of this recognition. And we hope you enjoy the reprise of this journey. This entry was posted in American Dance, Arts Advocacy, Ballads, Beginning Dancers, Chorus Songs, Contra Dance, Dance Callers, Display Dance, English Dance, Features & Fun, Folk Dance, Guest Posts, Musicians, Old Time Dance, Rounds, Song, Square Dance, Traditional Dance, Traditional Music, Traditional Song, Uncategorized on July 25, 2016 by Caroline Batson. Except for the first paragraph, which is from recent correspondence, this essay was posted on Facebook; it’s reprinted here with the author’s kind permission. In 1985 at 25 years of age, when I came out as a gay man, the world was a very different place than what it is now. At 55 years of age now, those of you who are much younger than I may not have the perspective that we who are a bit more mature have. Back then, there were few social groups, and most of the community was based around bars and other associated events. I can’t speak for anyone else, but I can speak for myself when I say that this was just not what I was looking for in my coming out process. I really wanted something very different that was not the mainstream part of what it was to be gay back then. I wanted to be a real human being, not just a gay human being, and I wanted to share good times with good folks, sharing healthy social time in a warm and inclusive environment. Never in all that time did I ever imagine that I could intertwine two very different worlds, my love of music and dance and my exploration of being a gay man. In fact early on, before I came out, I distinctly remember the moment when I had this amazing epiphany, and in that moment, it was the most exciting thing that had ever come to mind. And just as quickly I dismissed it. It wasn’t until I joined a men’s choral group in Providence, RI in 1986 where all that was to change. I overheard a conversation one evening, a friend of mine at the time, Bill Wilson, mentioned he has gone to see a Gay Rodeo out in Denver, CO. I couldn’t even imagine of such an event back then, but then he went on to say that afterwards he went to a square dance. My ears immediately perked up, and I turned around and asked, “You mean, a GAY square dance? ?” He replied, “Yes, they have been doing it out there for years.” As soon as I heard that, I knew I had to find a way to merge these two worlds together, and now 30 years later, we have a documentary of the power of what the vision of one person, shared with an entire community, can do. To all those who have shared this vision, and who continue to help in its course and in its future, to all those lovely individuals who have at one time or another graced our dance halls and dance camps with your presence, and to all those who have shared that this amazing community has helped them through their rough times in their lives, and have helped connect them to a warm and accepting group of like-minded individuals and lifelong friendships, I say a heartfelt thank you. It is because of all of you, who like myself, needed something a bit out of the ordinary, who desired a community of warm and accepting individuals, who understand that we can all make a difference, who understand the social power of dance, music, song, hugs, and the social interactions, that some 30 years later, we have this amazing community that continues to welcome lesbians, gay men, bisexuals, transgender, asexuals, intersex, queer, questioning, and straight friends. What an amazing diversity in a social time where there is so much extremism pulling at us from all sides. I take great comfort in sharing myself within this community. I know my life would be very different had it not been for LCFD. Please take a moment to watch this video. Please share this with your friends and families. Invite people to come and join us, and share this love with others. Each of us has the power to make this world a more beautiful place! Lavender Country and Folk Dancers (LCFD) has been working with filmmaker Nate Daniel on a full-length documentary about their dance community which is expected to be released in 2017. This short video is a preview of the longer documentary. LCFD sponsors, supports and promotes a nationwide network of local gender-free community dances and dance camps. Their groups are mostly contra and English country dances, but they also encompass several other dance traditions. While their focus is LGBTQ communities, they welcome everyone to their dances and camps. Chris Ricciotti is a dance caller and organizer and a member of LCFD’s Board of Directors; he lives in Massachusetts. This entry was posted in American Dance, Arts Advocacy, Ballads, Beginning Dancers, Chorus Songs, Contra Dance, Dance Callers, Display Dance, English Dance, Features & Fun, Folk Dance, Guest Posts, Morris Dance, Musicians, Old Time Dance, Round Dance, Rounds, Song, Square Dance, Traditional Dance, Traditional Music, Traditional Song, Updates from the Office on June 10, 2016 by Caroline Batson. It is a testament to the joy of contra dancing, that some folks will go to great lengths to make sure that they have opportunities to dance. Take Brooks Hart as a prime example. I had the good fortune to meet Brooks when he was involved with Village Contra in New York City. He volunteered many hours for that dance, and even did some calling. Since those days, Brooks has moved to Mérida, on the Yucatan Peninsula of Mexico. He is very happy there, but he missed contra dancing. He realized that the only way to do some dancing close to home was to start a dance. So he did just that! For the last year, he has offered a dance series in Mérida, and some occasional dances in Oaxaca. Despite the challenges of finding good dance space, and the ups and downs of attendance, he has remained true to his vision of having contra dancing in his new home town. Along the way, we started a very enjoyable email conversation, which included sharing dances, thoughts on music, suggestions for programming, as well as teaching, and lots of encouragement. As luck would have it, Brooks shared a dream he had of offering a dance weekend to which folks in the U.S. might be tempted to participate. His thought was that the influx of experienced dancers would be great for all his new folks, and the dance series might grow as a consequence. In addition, visitors would have a great colonial era city to visit and enjoy. This idea seemed wonderful to me, and I encouraged him to move forward with it…..and volunteered to help out by being his caller. Thus the Mérida Dance Week was born! Dance: contemporary dance, as well as traditional dances and events. Theatre: presentations, workshops and visits to various communities. Conferences: talks, lectures and conferences with leading characters. Literature: lectures, seminars, and presentations of books and magazines. Visual Arts: movies, documentaries, exhibition of paintings, photographs and handicrafts. Music: concerts, serenades, trips, dances, and traditional events. Brook’s plan is to have 2 or 3 contra dances, a waltz workshop, and a musician’s workshop during the week of January 16-23, 2016. To sweeten things even more: Amy Larkin (fiddle), and Linda Henry (piano), will also make the trip, so that we can enjoy fabulous live music! We are really looking forward to this trip! Since I speak Spanish, it will be fun to teach the dances in both Spanish and English. Brooks has been actually calling the dance moves in English. This seems to be the decision made by a number of folks who have begun contra/square dancing groups in locations outside the U.S. For example, in Denmark. The idea is that dancers can then dance in many more places, if they know the calls in English. As a result, a number of Danes have attended Pinewoods Camp, and had a great time! Brooks attended the New England Folk Festival (NEFFA) in 2015, and brought a friend from Oaxaca (who fell in love with all things Balkan! ), one of the contra dancers from Mérida, and her good friend from Louisiana. They all had a great time! We hope to tempt an even larger group from Mérida to join us at NEFFA 2016. I have offered hospitality to any who might be tempted, so we hope that dancers come and enjoy our Festival. We hope that as many dancers as possible join us in Mexico for this adventure. You can be kept updated, and discuss travel, lodging and excursion options, by asking to join the FB group, which is called: Mérida Contra Dance-January 2016 or you may also email me directly: laleslierjg@comcast.net. This entry was posted in American Dance, Arts & Tourism, Beginning Dancers, Contra Dance, Features & Fun, Folk Dance, Musicians, Old Time Dance, Round Dance, Square Dance, Traditional Dance, Traditional Music on January 8, 2016 by Lynn Nichols. We had the privilege of participating in a national organization panel at the National Square Dance Convention, late last month in Springfield, MA. Colleagues on the panel represented: CALLERLAB (http://www.callerlab.org), Contralab (http://www.contralab.net), Alliance of Round, Traditional and Square-Dance (http://www.arts-dance.org), United Square Dancers of America (http://www.usda.org/), Roundalab (http://www.roundalab.org), and the Canadian Square and Round Dance Society (http://www.csrds.ca). CDSS was invited to be on the panel and we were represented by Executive Director, Rima Dael. What are the challenges facing folk dancing today? What does your organization consider the greatest priorities to address? Are there possibilities of sharing and coordinating projects to address these issues together? What are your near term goals (next five years)? What needs to happen so that we can expect active participation in the various forms of dance for the next 100 years? (These are three areas CDSS has identified through the Strategic Direction and specifically articulated in the “CDSS Theory of Change” section in our recent Education Report. All the panelists shared concerns around time, money and cultivating volunteers needed to help keep our organizations going, and involving the younger folks in stewarding our art forms. Ironically, with many questions raised about how to involve youth, none were present in the conversation. Rima posed that we need to ask our younger constituents how to better engage them, and to consider defining what we mean when we say “youth”—in some instances, it could mean 40 or under, or students K–12, or young adults. There was a lot of discussion around involving next generation and youth participants. CDSS was the only organization on the panel that promotes intergeneration programs and has weeklong summer camps that teach kids, youth and young adults dance, music and song skills. It was an interesting discussion as the national organizations represented are all arts service organizations that serve their membership with programs and services from insurance to skill-building and best practice workshops. One thing we can learn from the Modern Western Square Dance groups are how connected many of them are with their local/regional Tourism Boards and the use of assisted hearing devices that are in sync with the caller’s microphone; these are two areas CDSS would like to investigate more. David Millstone, CDSS President, also in attendance at the panel discussion (and, in his teacher/caller’s role, leading several dance workshops at the Convention), shared with the panel and audience the new New Hampshire Art Council social dance map, based on West Virginia’s Mountain Trail Dance Map. It was great to see so many folks in downtown Springfield, from all over the country, dressed in their formal square dance attire. This was the Convention’s first visit to New England; we look forward to seeing them again soon. This entry was posted in American Dance, Arts & Tourism, Arts Advocacy, Ballads, Beginning Dancers, Centennial, Contra Dance, Dance Callers, English Dance, Features & Fun, Folk Dance, Ideas & Resources, Membership & Development, Musicians, Old Time Dance, Round Dance, Square Dance, Traditional Dance, Traditional Music, Updates from the Office on July 24, 2015 by Lynn Nichols. When I first heard about the Country Dancers of Rochester (CDR) scholarship program for CDSS camps, I developed an immediate interest. As a new caller—and as an experienced musician—I was looking for any opportunities to hone my skills in both areas, and just to collaborate with other callers and musicians. Having never been to Pinewoods before, I was initially struck by the mellow, woodsy environment, along with the two beautiful lakes/ponds situated next to the camp. Pinewoods is truly a New England paradise. The next revelation was the outdoor dance pavilion, again tucked back in the woods. There really is nothing like dancing outdoors in a covered pavilion in mid-August. From the first night it was evident that magical things would happen in the pavilion over the course of the week—in many ways, it was really the center of the camp. The final thing that struck me right from the start was the diversity and the energy of the campers. I confess, I was bracing for something perhaps a little more on the stuffy side when I first registered, but that notion was well wide of the mark —teenagers, college students, young couples, middle-agers, and more “seasoned” dancers all converged at the camp for a week of creativity and true rejuvenation. Gathering at 10 am every morning for Phil Jamison’s Southern Squares class. What a great tradition, and a great teacher. Having no sense of what distinguished a Southern Square from a New England or Western square, I quickly came to understand that Southern Squares are about improvisation, about calling to the beat of the music, not to the phrasing. What a liberation! For the rest of the week, we took turns inventing—and calling—squares to the great old time music of Julie Metcalf and company, always under the skillful guidance of Phil, who really seems to me to be David Kaynor’s long-lost Southern brother! Well, brothers in spirit at least…. The daily camp gathering that followed morning classes, but preceded swimming and lunch. A time for jokes, songs, stories, contests, and other spontaneous acts of generosity by staff and campers alike. It was the one time of the day when we really came together as a single camp, and it was an honor to see otherwise taciturn campers get up and perform in front of 150 audience members. The Roadhouse after-dance party, midweek. Okay, I’m biased here—being one-third of the nominal “house band” charged with backing up a small parade of crooners, blues singers, and jazz soloists—with a room full of enthusiastic swing, blues, and bossa nova dancers—is right where it’s at for me. They pretty much had to drag us off the stage at 1:30 am. Emily Troll’s music ensemble class—that is, band class for musicians. Okay, I confess, some of the “touchy/feely” interpersonal games at the start of each class reminded me a little too much of the upcoming school year (not an image I wanted to entertain), but once we got past those, the class was really useful and helped spawn several small instrumental ensembles that took the stage at Camper’s Night (see below). Gaye Fifer’s “Dutch Crossing”—hard to really put this into words, but definitely a highlight of the week. Look it up on YouTube if you want. Basically, a dance that requires 16 couples, takes 55 (intense) minutes to teach, and five minutes to actually dance. A great teamwork activity. Camper’s Night—a true highlight. A chance for (very talented) campers to run the evening dance. Somehow, I ended up in five to six music ensembles, so I never got to dance until the second half, but it was well worth it. A memorable, and somewhat revolutionary, segment: David Cantieni’s entire ear training class joined by Ann Percival’s entire chorus class performing “Wimoweh” as a contra dance set. It actually works! Looking back, both my calling and my playing have improved as a result of being at American Week—not only do I have an expanded repertoire of dances and tunes, but my skills have sharpened considerably. Had it not been for the CDR grant, and matching CDSS scholarship, I most certainly would have missed out on an invaluable experience. 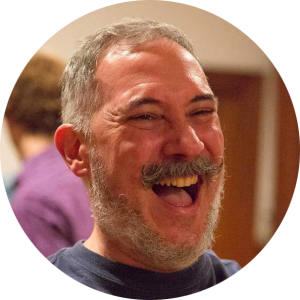 Chuck Abell is a contra dance caller and musician from Rochester, NY. His band, Tempest, featuring fiddler Tim Ball and several other great western NY musicians, just released its first full-length CD, Equilibrium, and will be touring extensively over the next year to promote the release. Keep an eye out for them, or visit www.chuckabell.com for more info on the band. Come to American Dance and Music Week at Pinewoods, August 8-15, http://www.cdss.org/american.html. Or the equally fine Harmony of Song and Dance, July 25-August 1, http://www.cdss.org/harmony.html. Space is available, and so are scholarship funds until we run out. 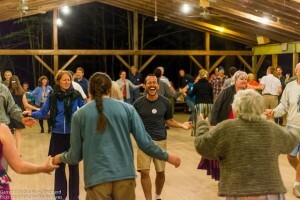 To read about all our programs at Pinewoods (MA), Ogontz (NH) and Timber Ridge (WV), see https://view.publitas.com/country-dance-and-song-society/country-dance-song-society-2015-camps/page/1. Questions? Call Country Dance and Song Society, 413-203-5467 x 2. This entry was posted in American Dance, Ballads, Beginning Dancers, Camps & Programs, Centennial, Chorus Songs, Contra Dance, Dance Callers, English Dance, Features & Fun, Folk Dance, Guest Posts, Ideas & Resources, Math, Musicians, Old Time Dance, Round Dance, Rounds, Song, Square Dance, Traditional Dance, Traditional Music, Traditional Song on June 29, 2015 by Lynn Nichols. Spread The Joy—It’s a slogan, it’s a song! Musician, songwriter and longtime CDSS member Jonathan Jensen, of Baltimore, sent us this lovely gift of his song in honor of our Centennial in 2015. It debuted on March 24, during Celebration Week. 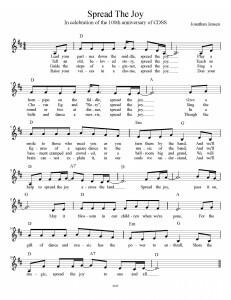 Download a PDF of the sheet music or listen to Jonathan and friends sing the song here. Or hear the song and watch the video here. In the CDSS world, I’m most active playing piano for English country dance, contra dance and couple dancing, as well as writing tunes in all these genres. Lately, though, I’ve become increasingly busy writing songs ranging from goofy parodies like The Tea Chantey to rounds and serious ballads. So as the 100th anniversary of CDSS approached I had a mind to write some kind of tribute in words and music. It was hard to get a handle on this project until I noticed the slogan “Spread The Joy” on one of the organization’s mailings. Once I decided on those three words as the title and the theme, the song all but wrote itself. There are so many ways we all spread the joy of music, dance, story and song in our various communities that I probably could have come up with dozens of verses (although the requirements of rhyme and meter do impose certain limitations). Once the song was written, I e-mailed a quick demo to CDSS headquarters, where it was well received. There was a thought of posting it on the website and Facebook page right away, but on reflection it was decided to make a professional recording with multiple voices that could be used as the basis of a video. There followed an e-mail and phone barrage to many likely participants and the inevitable poring over schedules to decide who the final cast would be and when we could all get together. I was very fortunate to have Charlie Pilzer offer his services and studio (Airshow Mastering) for free. Terry Leonino and Greg Artzner, who make up the celebrated duo Magpie are friends of the Pilzers, and kindly volunteered to take part. Veteran dance musicians Steve Hickman and John Devine signed on to sing and play. Multi-instrumentalist Paul Oorts offered to round out the texture on mandolin. And when I decided we should have a teenage singer to represent the next generation, Steve got his daughter Maren to come along—and his wife DeLaura Padovan joined in for good measure. On the evening of February 15 we all met at Charlie’s studio in Takoma Park. After a few run-throughs we worked out an arrangement that suited all the voices and made a number of takes, with me handling string bass duties. None of our readings were perfect all the way through, but we got to see Charlie work his wizardry as he swiftly replaced a faulty note or phrase from one take with a better version from another. We look forward to sharing the song with our friends across the nation as we join in celebrating the first 100 years of the Country Dance and Song Society. CDSS is delighted to have its own song for the Centennial—we look forward to singing it with friends and humming it as we work. 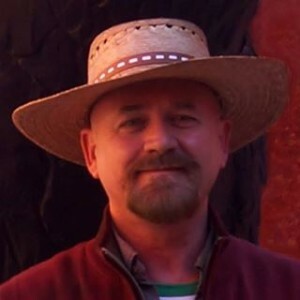 Thank you, Jonathan, for writing it; thanks to Charlie, Terry, Greg, Steve, John, Paul, Maren and DeLaura for the audio recording; and thanks to Mary Wesley for the video. This entry was posted in American Dance, Ballads, Beginning Dancers, Centennial, Chorus Songs, Contra Dance, Dance Callers, Display Dance, English Dance, Features & Fun, Folk Dance, Guest Posts, Morris Dance, Musicians, Old Time Dance, Round Dance, Rounds, Song, Square Dance, Traditional Dance, Traditional Music, Traditional Song, Updates from the Office and tagged cdss on March 27, 2015 by Lynn Nichols. “Gents Bow, Ladies Know How” traces the long history of traditional dance and music in southwestern New Hampshire from Colonial times to the present, with an emphasis on the 18th and 19th centuries. 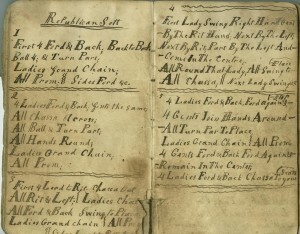 The Monadnock region of New Hampshire is one of the few places in the country where these dances have been done continuously since the mid-1700s. The exhibit features artifacts, documents, instruments, photographs and audio recordings. In addition to the on-going exhibit, there will be a series of presentations scheduled monthly beginning in February. “Gents Bow, Ladies Know How” will be open to the public through May 23, 2015. The Monadnock Center’s regular hours are Wednesday through Saturday, 10 AM to 4 PM, and admission is $3.00 (free for Monadnock Center and Country Dance and Song Society members). The exhibit takes place in the historic Monadnock Center building in Peterborough, New Hampshire at 19 Grove Street. Two local organizations, the Monadnock Center for History and Culture and the Monadnock Folklore Society, have partnered to develop this exhibit. Generous grant funding was received from the New Hampshire State Council on the Arts. In addition, the Animal Care Clinic-Monadnock has sponsored the exhibit—the owner is the grandson of the caller Duke Miller. The Country Dance and Song Society was the inspiration for this exhibit—the idea arose as the Monadnock Folklore Society brainstormed how to participate in the celebration of the CDSS Centennial. For more information call 603-924-3235 or visit http://www.MonadnockCenter.org. The Monadnock Center for History and Culture is a community museum that has been dedicated to preserving and celebrating local history and culture since its founding in 1902. The Monadnock Folklore Society was founded in 1980 to increase the visibility of folk dance and music events in southern New Hampshire and provide educational services in the folk arts to the community. Lisa Sieverts is an experienced project manager and facilitator, and owner of Facilitated Change. 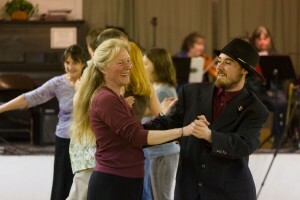 She is a longtime contra dancer and caller, and a regular caller at Nelson, NH’s Monday night dances. Lisa is a CDSS member and a member of the Monadnock Folklore Society’s board. This entry was posted in American Dance, Arts & Tourism, Arts Advocacy, Ballads, Beginning Dancers, Chorus Songs, Contra Dance, Dance Callers, Display Dance, English Dance, Features & Fun, Folk Dance, Guest Posts, History & Archives, Ideas & Resources, Musicians, Old Time Dance, Round Dance, Rounds, Song, Square Dance, Traditional Dance, Traditional Music, Traditional Song, Updates from the Office on January 22, 2015 by Lynn Nichols. 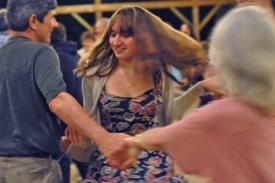 I first heard about contra dance at a small math conference in Northfield, Minnesota during the summer of 2013 when a graduate student described the connection between contra dance and permutation groups. Contra dance, a type of partnered folk dance, involves people dancing in two lines facing each other or in groups of four. 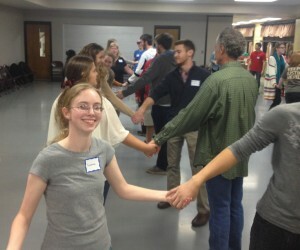 If the participants of a contra dance are each labeled with a number, with n being the total number of dancers, then their most basic interactions during the contra dance can be represented as permutations on the set of numbers one through n.
A permutation, put simply, means a reordering of members of a set, so a permutation of the dancers is a function that moves the dancers to other dancers’ positions, like two people swapping places (e.g. gents’ allemande), a group of four people circularly moving in a full rotation (e.g. circle left), or no one changing position (i.e. the identity permutation). If you combine these functions, adding one small dance step to another, you’re composing permutations, which is the operation that defines the algebraic structure known as a permutation group. 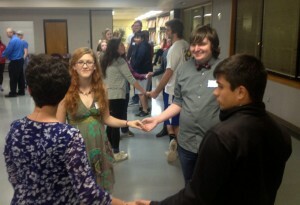 This link to mathematics brings something special to contra dance: it evokes a feeling of connection to the universe at large. Permutation groups themselves are only yet a subset of the set of reflection symmetries, which has applications anywhere symmetry is present: in the structure of a snowflake, in the arrangement of atoms in a molecule, and even in the transpositions and inversions in Bach’s Art of Fugue, which are precisely the symmetries of a dodecagon. Math is deeply and richly tied to music and dance, and my knowing that the movement of our bodies in dance symbolized a greater relationship between elements brought an almost spiritual aspect to my experience of contra dance.While the mechanics of the dance were explainable by the mathematical structures I’d previously come to understand, the experience itself involved so much more: a sense of community, an interaction with people normally distanced, and the exhilarating act of applying these abstract concepts I’d learned to movement in the physical world, with music playing and bodies moving all around me. 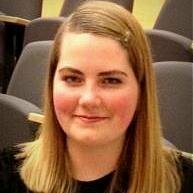 Lena Erickson is a senior at Oklahoma University in Norman, OK, majoring in math. Our thanks to CDSS member Miranda Arana who sent us Lena’s essay. She teaches Introduction to World Music for non-music majors at OU. This entry was posted in American Dance, Beginning Dancers, Contra Dance, Dance Callers, English Dance, Features & Fun, Folk Dance, Guest Posts, Math, Math & Science, Morris Dance, Musicians, Rounds, Song, Square Dance on December 11, 2014 by Lynn Nichols. Doug Plummer is well known in the dance community nationwide as that guy who takes all the dance photos and videos and puts them all over Facebook and in a calendar. Since 2012 he has self-published the Contradance Calendar, a premium wall calendar that captures the best contra dance moments from around the country. To get a 2015 calendar, support the Kickstarter campaign for it, which is live from now until September 11, or buy one from the CDSS store come November. 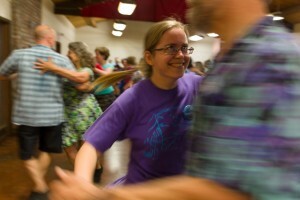 There is no such thing as a photograph of a contra dance. The only thing we can capture is a moment in a dance. So the first thing is to identify that: a moment that might be captured. Actually, let’s back up. The first thing is to identify how we feel at a given moment. When we dance, we go through a series of fleeting emotions. There’s the cordial greeting of a hands four. There’s the ramp-up anticipation of a balance. The connection of an allemande. The dramatic feeling of a wall of you convening and receding in a great long line. The delight of a new neighbor. The alarming stare down contest of a gypsy. The consummation of a lovely, long swing with your beloved partner, until you dump her for the next dance. When you watch a dance, those moments and feelings have physical expressions. There are bodies in contact and in connection that you can isolate and capture. That is the reason to have a camera at a dance—to more deeply connect with those significant, fleeting moments full of feeling, and to maybe stop and hold one. So, given that, what do you do to take a photograph that holds all that ambition? The first trick is to watch for just a single moment that you emotionally connect with. Shoot only that. Thirty-two beats later, it comes around again. Keep whacking away. How you feel inside is your signal that you might be getting closer. Here is maybe the most important advice to becoming a better photographer. Don’t stare at the back of your camera at what you just did. Don’t pay any attention to the results of your shooting. It only takes you away from the moment. All that investment in getting connected with the dance, with the dancers, with the beat and rhythm and the energy surrounding and carrying you away—look at the screen for longer than a second and you’ve left the room. It takes great effort to reenter. Edit when you get home. Another tip: get close. Get within elbow dodging range. Make people know you’re there. Be engaged with them. If someone doesn’t want you there, you’ll feel it and you can adjust. But that rarely happens. Don’t be a jerk, but don’t feel you have to be a wallflower in order not to be one. Everyone notices the person trying to photograph unobtrusively. If you’re in the middle, you disappear. The first thing I tell my workshop students is, go forth and fail. You have great aspirations to capture the perfect moment, and mostly you won’t. That’s part and parcel of the creative process. You flail and you fail again and again, and then, you get a glimmer of something that’s starting to work, and you chase that and see if you can do it again. It doesn’t matter a whit what kind of camera you use. The process of creative growth doesn’t care. Photography, especially in the digital age, is an act of great profligacy. That’s not to say that you shoot indiscriminately and without intention. Just the opposite. It takes a great deal of attention and effort to stay deeply connected with the moment, and from that connection comes the urge to click the shutter. It might happen a lot of times in a few seconds, particularly in the complex, dynamic environment of a contra dance hall, as a feeling hits. I rarely come away from an evening of photographing a dance with fewer than two or three hundred exposures. And I don’t sit out that many dances. And when you do sit at your computer that night, posting on Facebook? Don’t post the two dozen variations of a single move that are pretty good. Post only the best one. The fewer shots you post, the better photographer people think you are. And it indeed makes you a better photographer. This article is in the Fall 2015 issue of the CDSS News in both print and online versions. This entry was posted in American Dance, Arts & Tourism, Beginning Dancers, Contra Dance, Dance Callers, Display Dance, English Dance, Features & Fun, Folk Dance, Guest Posts, Ideas & Resources, Musicians, Old Time Dance, Publications, Round Dance, Square Dance, Store, Traditional Dance, Traditional Music, Updates from the Office on September 9, 2014 by Lynn Nichols. Can you make difficult class choices? Say, from an enticing menu of contras, squares and waltz? Are you up for a strong program of Appalachian, American Southern and Irish traditions? Can you take contras morning, noon and night? If your answer is “Just try me!” then CDSS’s American Dance and Music Week, August 9-16, 2014, at Pinewoods Camp is for you, whether you do it ALL or take a more leisurely approach. We’ll have two daily stretching sessions to keep you loose and limber, morning contras and waltz to wake you up, and afternoon squares and more challenging contras to spice up the mix. And more dancing in the evening too. Can’t dance all day? Not a problem. Bring your instruments and your voices because this week promises a full program of music classes and more, and you’ll be able to play and sing with your heart and soul. Want even more choices? How about getting messy and creative with paper, paint, glue and who-knows-what else in the daily community art class? Or sit on the porch or swim, jam or nap. Hmmm. There will be a wealth of talent to inspire and encourage you, and there will be friends, old and new, all under the pine trees in a beautiful wooded setting near Plymouth, MA. Join Program Director Sue Rosen, and experience American Dance and Music Week. See the class schedule, class descriptions or staff list, learn about Pinewoods Camp or about our other summer weeks. And here’s info about fees and scholarships. This is an amazing week—vibrant and relaxing, both. Not a bad choice, huh? See you there! Sue Rosen has been dancing all of her life and attended her first callers workshop at Campers’ Week at Pinewoods in 1989. Since then she’s become one of New England’s favorite callers and has written contras that have become part of the standard repertoire of dance callers across the country and overseas. This entry was posted in American Dance, Arts Advocacy, Ballads, Beginning Dancers, Camps & Programs, Chorus Songs, Contra Dance, Dance Callers, Features & Fun, Folk Dance, Old Time Dance, Round Dance, Rounds, Song, Square Dance, Traditional Dance, Traditional Music, Traditional Song on June 4, 2014 by Lynn Nichols.